The Cookoo and Cogito Classic watches are great options for someone who wants a watch that will subtly tell them what’s happening on their phone. They are stylish watches with connectivity, rather than full-on smart watches. Both devices focus on combining real watches with some connectivity to your phone’s functions. Right up front the big advantage lies in the fact you get the basic feature set you expect from a watch – a normal replaceable watch battery that will last for a year and water resistance. The fact they don’t need recharging is a definite benefit, especially if you a travelling. The focus on being a watch first also means that they come with stylish analog faces, albeit ones you can’t change the look of. When looking directly at the watches I though both looked great, although I had some difficulty reading the ultra-minimalist face on the Cookoo unit I tried – but that could just be my ageing eye-sight in action. I was less-taken with the watches sideways-on – both, but the Cookoo in particular, are chunky; no more so than often seems to be the style these days, but more than I could have hoped for. 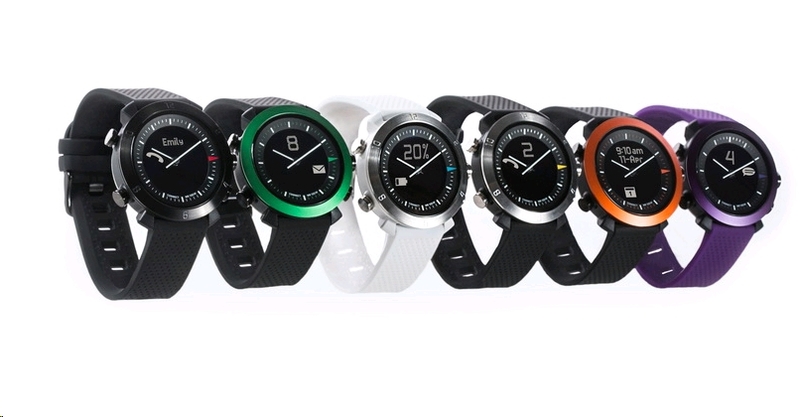 The smarts from these watches come with connectivity to your smart phone via Bluetooth 4. They connect to both Apple and Android devices (although not all of them), and little icons on the screen will let you know when you have an alert. The use of the icons is nicely minimalist, and just the sort of under-stated alert you might want while in a business meeting or while sitting in a theater. This really is a selling point of these watches for many people – they are not making a statement that you have a smart-device on your wrist. The flip-side of course is that these devices are inherently limited. There’s some limited ability to respond to the phone, but no real control in detail. That’s a decision you need to make right up front. Are you looking for a fully-featured smart-watch that’s a relay for your phone or even a phone in itself, or are you looking for a watch that can subtly let you know what the alert on your phone is all about? Assuming you’re on the latter track, these watches are seriously good. It’s also worth bearing in mind that the Cookoo is only just over $100 and the Cogito is around $200 – which are more the pricepoints for a watch rather than a smart-watch. Personally I far prefer the Cogito to the Cookoo – I like the look better and the Cogito has more functionality. I’m not going to end up wearing either though, because if I’m going to strap something solid around my wrist I’m geeky enough to be happy trading off subtlety and style for functionality. I can see many others will want to go the other way and these watches are cleverly placed to fulfill the desire for something stylish that also provides access to your phone. We tried review copies of the watches provided by the lovely folk at Expansys.